What happens when a southern classic meets Mexican flavors? 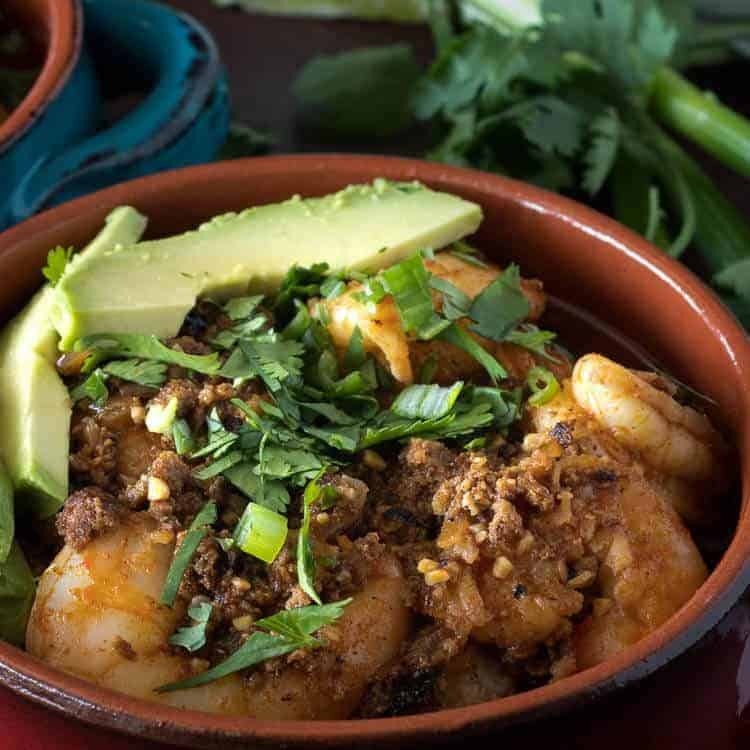 Healthy Mexican Shrimp and Grits! The flavors and textures of this dish will dance on your tongue… This tasty main dish can be on your table in 45 minutes or less! Bubba: Anyway, like I was sayin’, shrimp is the fruit of the sea. You can barbecue it, boil it, broil it, bake it, saute it. Dey’s uh, shrimp-kabobs, shrimp creole, shrimp gumbo. Pan fried, deep fried, stir-fried. There’s pineapple shrimp, lemon shrimp, coconut shrimp, pepper shrimp, shrimp soup, shrimp stew, shrimp salad, shrimp and potatoes, shrimp burger, shrimp sandwich. That- that’s about it. You might ask “Tamara, what makes it Mexican?” Flavor profiles drive my culinary creations, and Mexican flavors are among my favorites. 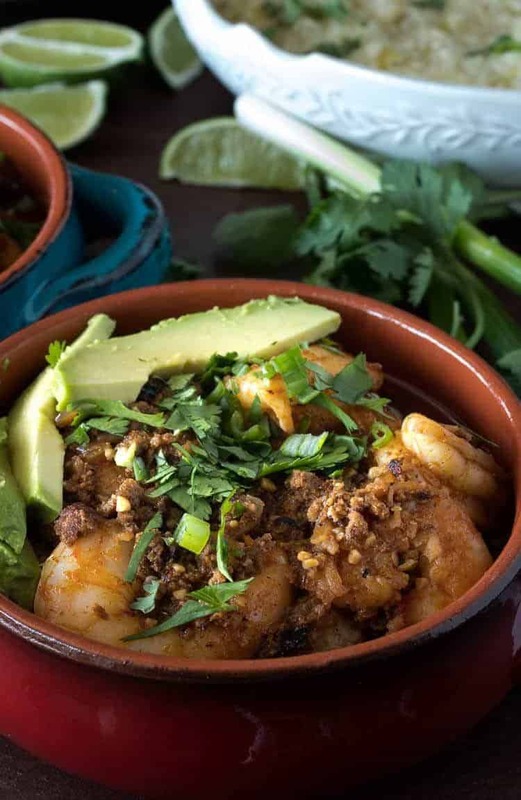 Ingredients specific to this recipe include Mexican chorizo, green chile, cilantro, cumin, lime juice, and avocados. 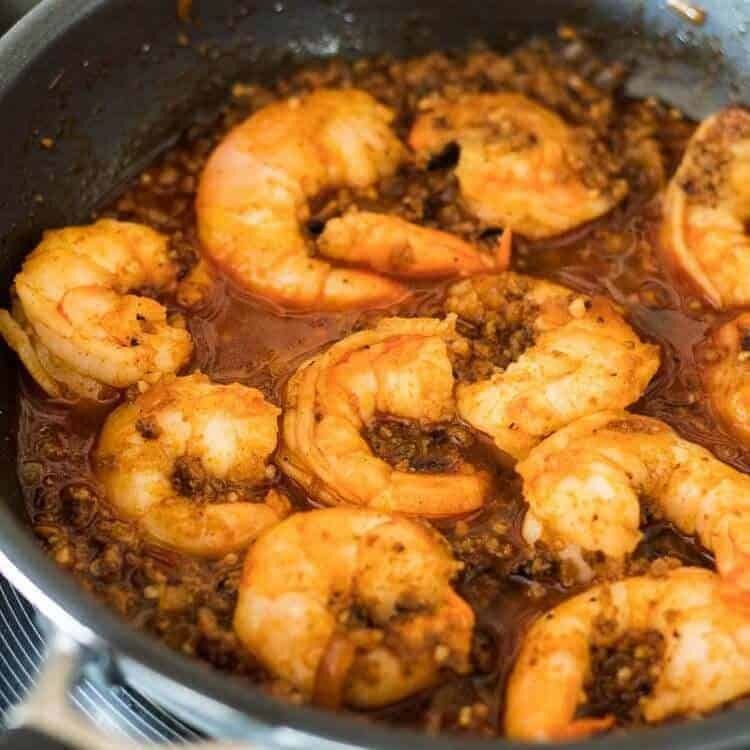 You won’t find any of these in classic shrimp and grits, but you’ll find their bold flavors mean you don’t miss the heavy ingredients typically associated with the classic version. I keep a canister of “5 minute grits” in my pantry. I don’t care for the texture of instant grits. Coarse-ground grits are awesome, but the extra cooking time required would relegate them to the infrequent weekend/entertaining menus. 🙁 A word of warning: I don’t know that my grits have ever finished cooking in 5 minutes. I like them thick and creamy, all liquid absorbed. Classic shrimp and grits typically includes cured (often fatty) meat such as andouille or ham, and a generous amount of it. I didn’t dispense with that idea entirely; I chose to use a very lean Mexican chorizo bulk sausage made with chicken (available at my local Sprouts market). I also cut way back on the quantity. I find the flavor is bold enough to balance the dish with just a couple of ounces. Don’t be discouraged if you cannot find chicken chorizo. Many grocery meat counters/cases carry lean pork or beef chorizo as well. You do want to avoid the Mexican chorizo that comes in a tube or casing that is little more than orange fat. It should look like lean ground meat (mince). The rest of the ingredients and method in Healthy Mexican Shrimp and Grits are probably pretty familiar to you. We love this dish paired with Mexican Fried Green Tomatoes (recipe on the blog soon)… I’d venture a guess you’re going to love this… Please let me know via the comment box at the bottom of the post if you try it! Peel and de-vein the shrimp (if necessary). 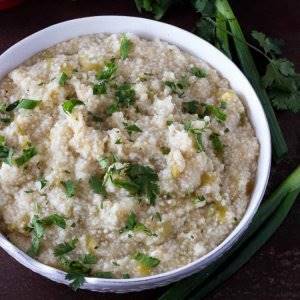 Start the grits – broth/stock, salt, and grits – over medium-high heat in a small saucepan. Reduce heat and stir occasionally. Cook the chorizo until crumbled, add the shallot, garlic, and cumin. De-glaze with the sherry or white wine; add the broth. Reduce to a low simmer until ready to finish. Prep the garnishes. When the grits are thickened and liquid is absorbed, add the remaining grits ingredients. Stir well to combine, cover, and turn off the heat. When the grits are ready and waiting, increase the heat on the chorizo mixture to a soft boil. Stir in the shrimp, and cook until the shrimp are pink and opaque. DO NOT OVERCOOK! It should only take 4-5 minutes to cook them depending on heat level. Squeeze the lime juice over the chorizo and shrimp mixture. Stir to combine. To serve, spoon the grits into a deep-rimmed dish. Top with the shrimp, and garnish. Enjoy! Are you interested in more amazing shrimp dishes? Take a look at my Spring Risotto with Shrimp, Chevre, and English Peas, or Mango, Avocado, and Gulf Shrimp Ceviche Tostadas. 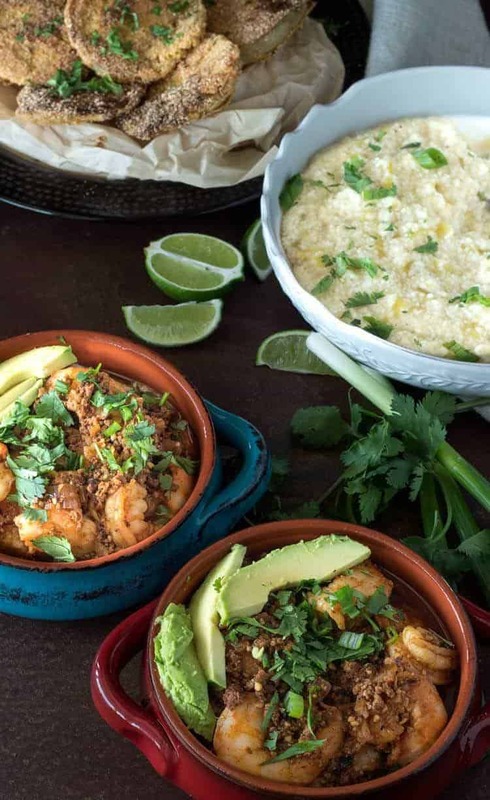 Bold Mexican flavors replace half n half, cream, and andouille in this healthier version of the classic shrimp and grits! Add broth/stock and salt to a small saucepan over high heat. Bring to a boil. Reduce heat, and whisk in grits. (This helps to avoid lumps). Return to a gentle boil, then reduce heat to a simmer. Simmer until the liquid is absorbed. (5 to 15 minutes. Check package instructions). Stir in butter, green chile, and cheese (if using). Cover and remove from heat until ready to serve. Cook the chorizo until crumbled, add the shallot, garlic, and cumin. Cook until fragrant and shallot is soft (about 4 to 5 minutes). De-glaze with the sherry or white wine; add the broth. Reduce to a low simmer until ready to finish. When the grits are resting covered, and the chorizo mixture is simmering, add the shrimp. Cook, stirring regularly, until shrimp are pink and lose their transparency. This process may take 3 to 5 minutes depending on how hot your pan is. Be careful to NOT overcook the shrimp. Squeeze lime halves over the shrimp, and stir gently to combine. Spoon a scoop of grits into each deep-rimmed dish. Top with shrimp. Garnish as desired. Enjoy! I use seafood or shrimp broth if I have it, chicken if not. The broth/stock "bumps up" the flavor lost by using cream and lots of butter. I keep Hatch green chile in my freezer, and Hatch canned chile in my pantry. As this is typically a weeknight meal (and I've neglected to thaw anything), I usually use a can of Hatch green chile. The amount is not critical. You can substitute chopped, roasted poblano chile, or even a jalapeño or serrano (or two). The choice is yours, just keep in mind the level of heat. As I mention in the post, this dish is fantastic with Mexican Fried Green Tomatoes. I will link to the recipe as soon as it is posted! Macronutrients (approximation from MyFitnessPal): 447 calories; 35 g protein; 39 g carbohydrates; 15 g fat. Wow! Just made this dish and it is delicious! Definitely a keeper. I served it with grilled corn and zucchini w/lime compound butter. This is the first recipe of yours that I have tried and I'm sure I'll be back for more. Yay! It means so much when someone takes the time to let me know a recipe was enjoyed. I'm so glad you liked it! Oh, this sounds really good! I always buy the "real" grits when back visiting the South, so I have them on hand when we get in the mood for a version of this classic dish. I usually make mine with coconut milk (cook the grits in part water, part coconut milk), which gives them a creamy flavor. I skip the sausage altogether, but chorizo would be yummy. I also saute julianned strips of onion, red, orange or yellow bell peppers and summer squash, and add that along with the shrimp. Look forward to trying out your version next time we have a shrimp and grits craving. Your recipe sounds awesome Elizabeth! I love using seasonal produce and changing things up. Like you, I try to find ways to lighten up a lot of my dishes, and this one was pretty successful. I didn't find I missed the andouille, butter, and cream of the Southern classic! Absolutely LOVE this version of Shrimps and Grits!!! We try to make shrimp and grits, southern style about once a month. This month I'm seeing this on the table. Just bought a pound of cotija cheese and made a triple batch of chorizo. And with the fabulous avocados we're getting this year, your recipe is must! Thanks MJ! I soooo appreciate your feedback on my recipes... AND, I've been wanting to make bulk chorizo (I have the sausage attachment for my Kitchenaid and rarely get it out!). Would you mind sharing your recipe?